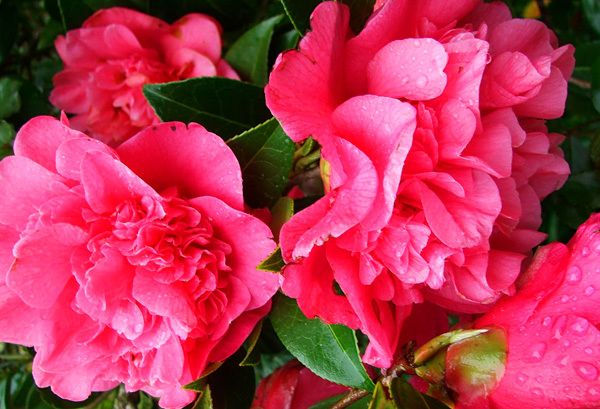 This bright warm pink camellia (name unknown) can be seen from the house in mid-spring. Another Moosey original, it is growing in a small shrubbery off the driveway. 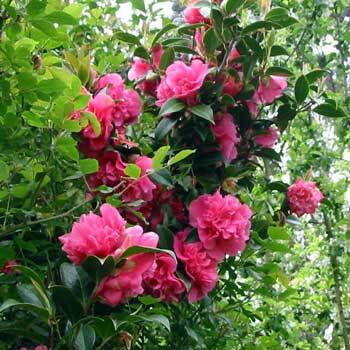 There is serious over-crowding in here, and the unknown camellia is mature enough to reach up through its neighbours and flower brilliantly on top of the small trees. The first flowers always take me by surprise - suddenly they are there - and I'm always cheered by the warm deep pink tones. Original plantings include a light lime-green conifer, with a spidery outdoor lamp directly in front of the Camellia. The colours of the two shrubs work really well together. Every year I pick some of the flowers to warm up the house. My favourite arrangement is to put them in a plain blue bowl - very simple and effective. This lovely shrub thrives on neglect. I really should clear some space for it, so as to get even more blooms - perhaps that could go on my next gardening list!